Clotilde Dusoulier is the ultimate Parisian insider, one who shares her tasty tales of life in Paris on her blog, Chocolate and Zucchini. In this very handy guide, a native Parisian happily leads us around Paris, taking us from little-known specialty food shops and classic bistros to authentic Japanese noodle bars and venues for wine tastings. 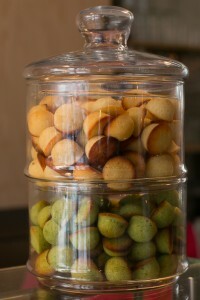 One of my favorite parts of Clotilde’s Edible Adventures in Paris are tips on how restaurants and food shops work here. For example, knowing that you’re not a “customer” but a “guest” explains a lot of things to foreigners, who are used to the Customer is King attitude. Other cultural tips, like keeping your hands on the table while you’re eating and not resting your bread on the edge of your plate, are explained so you can avoid making a faux pas, as I did shortly after I arrived in Paris and was scolded for my bread infraction by the host at a dinner party. And I always thought it was rude to scold guests! Who knew? This is a highly-personalized list of places to eat from someone intensely interested in finding good food, not afraid to explore some of the lesser-known addresses and neighborhoods, including a Togolese wine bar (pg 132), a soup and dumpling restaurant, and an oyster bar (pg 242) up by the Gare de l’Est that I thought no one else ever heard of. Good lord—it’s in there! There are a few of the standards, and upscale hot spots, but I appreciated most the places that are off-beat, and my book is riddled with post-its, marking off places that I want to follow up on. Residing in Paris for almost 20 years, Alexander Lobrano has become known for his dispatches to Gourmet magazine about the local dining scene. 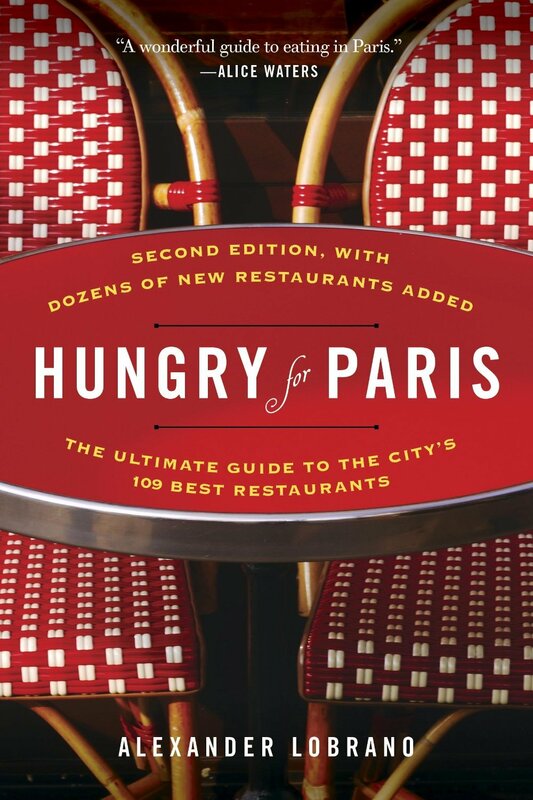 Being a rabid gourmand, Hungry For Paris: The Ultimate Guide to the City’s 102 Best Restaurants, has too much information to stick in your pocket or bag for the day; savvy travelers should just jot down addresses prior to heading out. When I got the book, I started flipping through it, jumping in and out of various chapters listlessly. But the writing was so good, I wanted to do it justice and read it front-to-back, and found it to be not just a list of restaurants, but a truly superb read. 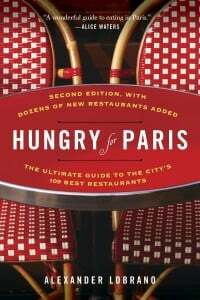 To get this, at the beginning are great tips about dining in Paris, from what to expect (and not to) in a restaurant, to how to appreciate the professional service one gets in a restaurant in France, which is often confused for being aloof. Mr. Lobrano deflects critics in advance: at the end of the book, he notes a list of restaurants that he’s omitted, and why. It’s a great read and warns us away from a few well-known tourist traps, such as Allard and Bofinger, each of which gets a well-deserved dressing down. 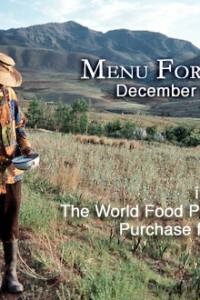 Although I’m not sure I agree with his assessment that “…there’s no city in the world where you eat better. 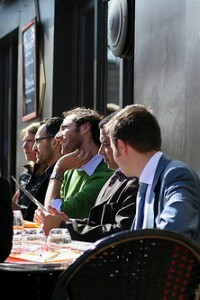 Period.”—I do think there’s some excellent food to be had in Paris if you know where to look. And both of these books will lead you right to it. David, Thank you so much for my great laugh of the day. I loved the story about the “Verge Noir”. Thank you, thank you. And keep on writing, Stupid Boy! I have been meaning to buy those 2 books for quite sometimes. Now that you wrote the article about them, I am convinced that I must buy the books. Thanks for writing up these two books. Like ELRA I have been planning to get them for a while now, and this was just the push I needed to stop by the store on my way home. Oh I bought Clotilde’s book when it came out in May, just in time for her book tour and her stop in LA! I got her signature on my copy which I took with me to Paris on my trip a week later! I loved her advice on how to try and speak some French first and to walk into a shop thinking you are a guest in someone’s home. I came away with the feeling that everyone was very polite and friendly. No kidding!! Sadly there were too many places and too little time. maybe it’s because i’m chinese and i grew up with it? i really thought i was normal lol. Hmmm…well, if the rest of the book is like that, I don’t think I am going to agree with much of Mr. Lobrano’s commentary. Having also lived in France, and eaten out, and witnessed numerous interactions between waitstaff and natives, and waitstaff and “foreigners,” I have learned a couple of things: waitstaff can be unpleasant and problematic at times even with the French (as local waitstaff everywhere can be at times with locals), and that treatment by waitstaff towards tourists (particularly Americans) had relatively little to do with how “close” they were seated to the French. Tourists who are polite, decently dressed, speak in measured tones, and are respectful tend to be treated fine by the waitstaff, even if they know little French. Loud, obnoxious voices, grubby attire, etc. on the part of tourists is generally met by poor service. Clotilde’s book sounds wonderful, though! I remember when Clotilde regularly posted recipes instead of talking about book tours… ahh, the good old days. Still, sounds like two useful books for the next time I visit Paris. I go to Rome every month, and I don’t find food to be better there than in Paris. It sure is cheaper ( as is almost everything there). Hi Steve: Thanks for your comment. I think that in her book, she’s trying to explain French customs to those that aren’t aware of them, since they really are differences that need to be minded. I know readers have written to me that they’ve gone in to a restaurant, without reservations, and were treated what they thought was rudeness. (And may have been.) Or committed gaffes, which I’d done on a number of occasions myself. As an American, there’s a lot of that kind of stuff that I didn’t completely understand until I moved to Paris. I thought she did a good job of balancing the two, and the restaurant suggestions are pretty spot-on. So glad you found the rest of the book interesting.